This stunning 18-song two-hour+ concert was captured last year at the spectacular art-deco Pantages Theater in Hollywood, California. Sheryl Crow, touring in support of her 100 Miles From Memphis album, performs a set filled with all her hits, deep catalog cuts and current songs, an 18-year trip. Bonuses include a “Behind-The-Scenes” segment wherein she preps for the show, introduces the band and soundchecks two more tracks—“Eye To Eye” and “Stop” (20 songs total). 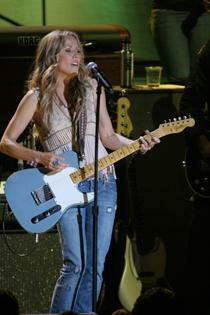 First things first, I must admit I'm not much of a Sheryl Crow fan. I don't dislike her music exactly, but I wouldn't say I'm terribly fond of it either. Really, I just sort of find her voice and songs to sound kind of obnoxious and uninteresting. With that said, fans of the artist should take this part of the review with a pretty big grain of salt, as you'll most likely find a lot to enjoy in this concert regardless of my particular opinion of her material. Filmed in Hollywood back in November of 2010, 'Sheryl Crow: Miles From Memphis' is a two hour concert video featuring the famed singer/songwriter. Throughout the show, Crow performs some of her biggest hits along with some new tracks. Joining her on stage is a pretty substantial live band consisting of several guitars, drums, a saxophone, trumpet, piano, and even some backup singers. The music is decent enough, mostly filled with harmless, breezy, forgettable melodies and lyrics that sort of run into one another with little distinction, though there definitely are a few catchy standouts. Crow has good stage presence and does a nice job of connecting with the crowd, but I wouldn't say she's a very impressive performer. The band itself is strong and adds a welcomed bit of punch to the proceedings with a few interesting and fresh new arrangements of Crow's most popular work. Some tracks even have a slightly funky twist, which is actually surprisingly effective. In total, the musician performs a selection of eighteen songs throughout the concert. Highlights for fans include, "If It Makes You Happy", "Soak Up The Sun", and "All I Wanna Do", though I actually enjoyed her rendition of the Jackson Five's "I Want You Back" the most. The concert itself is pretty standard fare with no real surprises or standout cinematic touches. The lighting scheme is pleasing if not terribly original, frequently bathing the stage in some atmospheric colorful hues. The filmmakers make sure to cover the performances from a variety of angles, adding a nice bit of immersion. An occasional cut to the audience (which is made up of a pretty bizarre and eclectic mix of people I must say) or a brief backstage view are also mixed in to liven things up every now and then. Crow mostly sticks to vocals but will also join the band with a guitar or piano on certain tracks. Most songs are immediately followed by the next with little fanfare, but the musician does take a few opportunities to interject with a brief introduction or quick story about certain tracks, and even adds in a few improvised bits to her rendition of "Strong Enough" describing the kind of man she's looking for (apparently, Republicans need not apply). 'Sheryl Crow: Miles From Memphis' is a basic, straightforward concert video. It makes no attempt to stray from a conventional approach or differentiate itself from other similar efforts by various artists, though really, it doesn't need to. Fans of the musician will know exactly what to expect here and Crow does a fine job of doing what she does best. For me though, the music is pretty disposable and uninteresting. With that said, at a little over two hours in length, covering a lot of her most admired work, this is definitely a nice if not terribly stimulating show for followers of the singer. Eagle Rock brings 'Sheryl Crow: Miles From Memphis' to Blu-ray on a BD-50 disc in a standard case. Included in the package is a seven page insert featuring a letter by Crow discussing what it was like to work with the band (dubbed The Thieves) on her tour. The concert is presented in a 1080i/AVC transfer in the 1.78:1 aspect ratio. Shot digitally in high definition, it looks rather nice. The source itself is clean with no major distracting artifacts, though there are a few signs of visible noise here and there. Detail is good, but there's rarely an impressive level of depth. Colors are rich, showing off the show's vibrant shifting lighting schemes with some welcomed pop. Black levels are consistent and contrast is strong. Like most concert discs, the real focus is on the audio, but this video transfer is more than acceptable, providing a pleasing high definition look at the show. 'Sheryl Crow: Miles From Memphis' is provided with an English DTS-HD Master Audio 5.1 track, an LPCM Stereo track, and a standard Dolby Digital 5.1 track. For the purposes of this review I primarily listened to the DTS track, but also sampled the LPCM periodically throughout to compare, and both are very strong. The DTS track features crisp, full vocals and some strong separation between all the musical elements, creating a broad and expansive soundscape. Surrounds are also used effectively with crowd reactions, providing an immersive concert experience. The music style doesn't really lend itself to much range, but dynamics are still strong on the few tracks that offer more variety. Crow's music isn't exactly known for a terribly deep low end, but thanks to the band, bass activity is still surpassingly good and actually packs some power on a few songs. The LPCM track does seem to offer a slightly noticeable increase in fidelity, providing a marginally deeper listening experience (though it's also mixed at a slightly higher volume, which may account for these apparent perceived strengths). This of course comes at the expense of the extra immersion offered by the 5.1 mix. Factoring in this trade off, I'd still go with the 5.1 track, as I feel the benefits of the additional channels outweigh the very slim, if not nonexistent, differences in audio depth. Whether you go with the DTS-HD MA 5.1 or LPCM stereo track, this is an impressive audio presentation, giving a wonderfully full and inviting listening experience. Eagle Rock has only provided one supplement, but it does offer some good extra material. The featurette is presented in 1080i with LPCM stereo sound and optional English, French, Spanish, German, and Japanese subtitles. 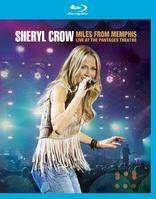 Behind The Scenes with Sheryl Crow (HD, 19 min) - This is a behind the scenes look at the concert. Crow discuses the tour as backstage footage is shown from rehearsals and sound checks. Two full rehearsal performances of "Eye To Eye" and "Stop" are also included, making this a nice little bonus. While I may not be a fan, 'Sheryl Crow: Miles From Memphis' is still a strong effort from the musician. The video presentation is good and the audio is fantastic. Though there's only one lone supplement, it's still a pretty nice bonus. Fans should be more than pleased with this disc.